It has been two years since Kenny Lattimore's self-titled debut release hit the R&B genre. With it's release in 1996, it spawned various hits, the most notable and truly unforgettable was the commitment serenade entitled, "For You". The song has already become a wedding classic in a short span of time. 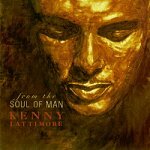 On his first release we heard Kenny Lattimore, "the new kid", on his new release, "From The Soul Of Man", we hear a contextually matured Kenny Lattimore. Still thankfully lingering is his beautifully translucent tenor vocals that have made him one of the few artists today whom people await to hear live. Kenny took on a more honest approach with this second album, he blossomed into manhood it seems. Nothing lacking, "From The Soul Of Man" is one of those albums that accentuates the craft of this artist. His vocal abilities, his writing style, and his contribution to the field of honestly original singers is as pure as music can come these days. "From The Soul Of Man", is very close to flawless! The fourteen track album is filled with honest statements that in all fairness, does come from the soul of a man. With lyrics that are untainted and never comprised, each song flows effortlessly into one another. He bears many things, his heart being the most recognizable. Dealing with many facets of a relationship, he takes us through the mind of a man who struggles with his own personal demons in order to deal with, and in many cases, appreciate the person he has decided to love. This album is unlike anything R&B I have heard lately. Not lavishing us in all the "what I want to do with you, to you, for you", Kenny takes on more real issues, causing his music and message to change into more mature forums of listening. As a woman, he forces me to see the other side, the side that sometimes men find hard to divulge to the women they are in relationships with. In "Days Like This", we hear how sometimes letting yourself love someone can bring pressure, especially when you can't clearly define to your own self just where you want to be in someone's life. "Trial Separation" is a pulling track that eases you into it's message. "If I Lose My Woman", one of my favorites, is a great ballad that really catches you off guard. It is a possible tear jerk with sweet strings and soft harmonies that tug at your emotions, in the end it becomes a declaration of dedication. Simply beautiful. On "Make Believe", Kenny lends that deep alto tenor that rolls and plays with your ear gently. His voice is exquisite! Smooth, slow and slick with great jazz elements. "Just Can't Get Over You", is one of those tracks that is reminiscent of his former, "Never Too Busy". He eases into his vocals on this album without effort and an almost breathy whisper and hum. Once again, there is a definite jazzy funk stroll in the instrumentation. On "I Love You More Than You'll Ever Know", one of two remakes on the album, Kenny Lattimore leaves me utterly speechless and totally star struck! An old Donny Hathaway classic, he took this remake and is making it into a combined effort by he and the late Donny. This has got to be one of the best remakes I have ever heard, not changing much with vocal delivery, he still seems to do such justice to the track, paying homage to one of R&B's legends. Donny Hathaway would be very proud! "Destiny", another favorite, is a uptempo, almost playful track that certainly will cause some movement. Great tune, wonderful instrumentation, fabulous vocals! "Tomorrow", another favorite, so smooth, so honest. "While My Guitar Gently Weeps", his second remake from the album is a former Beatles track written by George Harrison. I cannot say how the former version sounds since I have never heard it, but from what others have told me, Kenny has someone reformatted the song and made it into a rather enjoyable tune. I know I certainly love this track. The soft strings and the running chords that flow and fall are enchanting. His sweet falsetto/tenor/alto rides effortlessly. Beautiful! "Heaven And Earth", is one of those sweeping tracks that can mesmerize the soul, it's strings are fluid. "Well Done", is the obligatory thanking of life's creator (God), that most R&B albums have today, only difference, Kenny does it his way. The guitar picks and plugs are heard and his vocal flexing is a gift from God in itself. He demonstrates his blessing of voice and his praises ring high. The final noted track is a song from the "The Lion King II: Simba's Pride". It is a duet with Heather Headley entitled, "Love Will Find A Way", a tune that is beautifully recorded by both artists. A hidden track, "If You Could See (Through My Eyes)", once again finds Kenny in glorious vocal form. The album as a whole gets an outstanding 5 from me. It is perfect in every way in terms of sophomore contributions. Kenny Lattimore is an artist that ranks as one of the more creatively talented. His vocal abilities and his dedication to his art is something that seems to not be negotiable to him musically. He leaves me speechless with his talent and his material. I urge anyone with an ear to pick up his current CD. Thank you Kenny for being the artist that you are. As an R&B fan, I willfully surrender my ear to you.